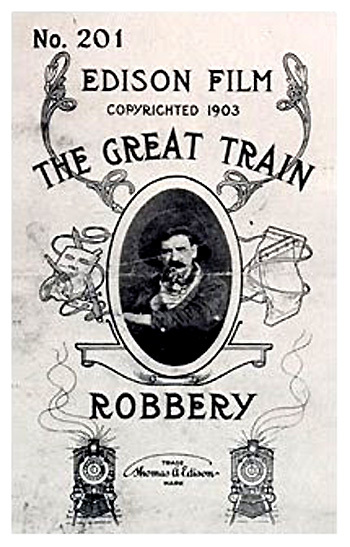 One of the milestones in film history was the first narrative film, The Great Train Robbery (1903), directed and photographed by Edwin S. Porter - a former Thomas Edison cameraman. It was a primitive one-reeler action picture, about 10 minutes long, with 14-scenes, filmed in November 1903 - not in the western expanse of Wyoming but on the East Coast in various locales in New Jersey (at Edison's New York studio, at Essex County Park in New Jersey, and along the Lackawanna railroad). The precursor to the western film genre was based on an 1896 story by Scott Marble. The film's title was also the same as a popular contemporary stage melodrama. It was the most popular and commercially successful film of the pre-nickelodeon era, and established the notion that film could be a commercially-viable medium. The film was originally advertised as "a faithful duplication of the genuine 'Hold Ups' made famous by various outlaw bands in the far West." The plot was inspired by a true event that occurred on August 29, 1900, when four members of George Leroy Parker's (Butch Cassidy) 'Hole in the Wall' gang halted the No. 3 train on the Union Pacific Railroad tracks toward Table Rock, Wyoming. The bandits forced the conductor to uncouple the passenger cars from the rest of the train and then blew up the safe in the mail car to escape with about $5,000 in cash. The film used a number of innovative techniques, many of them for the first time, including parallel editing, minor camera movement, location shooting and less stage-bound camera placement. Jump-cuts or cross-cuts were a new, sophisticated editing technique, showing two separate lines of action or events happening continuously at identical times but in different places. The film is intercut from the bandits beating up the telegraph operator (scene one) to the operator's daughter discovering her father (scene ten), to the operator's recruitment of a dance hall posse (scene eleven), to the bandits being pursued (scene twelve), and splitting up the booty and having a final shoot-out (scene thirteen). The film also employed the first pan shots (in scenes eight and nine), and the use of an ellipsis (in scene eleven). Rather than follow the telegraph operator to the dance, the film cut directly to the dance where the telegraph operator enters. It was also the first film in which gunshots forced someone to dance (in scene eleven) - an oft-repeated, cliched action in many westerns. And the spectacle of the fireman (replaced by a dummy with a jump cut in scene four) being thrown off the moving train was a first in screen history. In the film's fourteen scenes, a narrative story with multiple plot lines was told - with elements that were copied repeatedly afterwards by future westerns - of a train holdup with six-shooters, a daring robbery accompanied by violence and death, a hastily-assembled posse's chase on horseback after the fleeing bandits, and the apprehension of the desperadoes after a showdown in the woods. The steam locomotive always provided a point of reference from different filming perspectives. The first cowboy star, Gilbert M. 'Broncho Billy' Anderson played several roles: a bandit, a passenger who was shot in the back, and a tenderfoot dancer. The remarkable film was greeted with the same kind of fanfare that Sam Peckinpah's violent The Wild Bunch (1969) received many years later. The action of each scene is told with only one shot. Almost every shot is a static, long shot, confining the action to the perspective of the camera at eye level. Tension and excitement is achieved by moving the players, rather than moving the camera angles. Two masked robbers enter a rural RR telegraph office and force the station's telegraph operator to get the 'signal block' to stop an approaching train. Through the window of the station, the train is seen coming to a stop. They make him write a false order to the engineer to take on water at this station (instead of at "Red Lodge," the regular watering stop). The bandits crouch out of sight while pointing their revolvers at him, as the train conductor approaches the window. The frightened telegraph operator delivers the note with the fictitious order to the conductor. As soon as the conductor leaves, they knock the operator out with a blow to the head. They tie his legs together and his arms behind his back and leave him on the floor. The bandits also place a gag around his mouth. They quickly move outside to catch up with the train, seen starting to move through the window. The bandits hide behind the water tower near the station as the train slowly pulls up and takes on water - due to the false order. The desperadoes stealthily sneak on board the train (between the tender, the car attached to the steam locomotive that carries fuel and water, and the express mail car) just before it pulls away. The car's mail messenger is busy at work in the mail car as the train moves along. Through the open side door of the car, moving scenery can be seen. The worker is alarmed when he hears an unusual sound. He peeks through the door's keyhole leading to the tender and locomotive cab and sees the two bandits trying to break through the express car door. After being startled, he quickly recovers and locks the strong box containing the valuables, and throws the key out of the open side door. He draws his revolver and crouches behind the work desk, just as the robbers break down the door and enter. After a pistol duel, the messenger is killed. While one of the bandits stands watch by the door, the other one tries to open the strong box. When he finds it locked, he vainly searches the messenger's pocket for the key. To open it, he attaches an explosive to the safe and then runs for cover after lighting the fuse. The dynamite explosion blows the box open, sending billowing smoke - tinted red - and bits of money into the air. They grab the valuables and three mail bags, and leave the car through the door leading to the locomotive cab. The train is moving about 40 mph. While the two bandits have been robbing the mail car, another bandit climbs over the tender and holds the engineer at gunpoint. A fourth bandit struggles with the fireman, who has seized a coal shovel for defense and climbed up on the tender. They have a fist-fight on the tender until they fall. The bandit has the advantage - he lands on top of the fireman. He takes a lump of coal and strikes the fireman on the head until he is unconscious. Then after overpowering him, he hurls the victim's body off the top of the moving train. [This was a startling special effect, although it was only a dummy figure.] The two bandits force the engineer to bring the train to a stop. At gunpoint, the engineer is forced to leave the locomotive, and walk back to uncouple the locomotive from the rest of the passenger cars. They walk back to the front of the train and board the locomotive. The engineer is forced to pull the train ahead about 100 feet, leaving the rest of the cars behind. Scene 6: An exterior scene showing the coach section of the train - the holdup. The train passengers are forced to leave the coaches. One of the gun-wielding bandits compels everyone to keep their hands up. All of the passengers are lined up along the adjoining train tracks. While they are threatened and covered with a gun, the bandits rob them of their valuables. One of the passengers (Gilbert M. 'Broncho Billy' Anderson) runs away from the group in an escape attempt, but is shot in the back. After everyone has been searched and robbed, the bandits terrorize the passengers by firing their guns into the air. They make their escape to the locomotive at the front of the train. After the bandits have disappeared, the passengers rush to assist the wounded man on the ground. The bandits board the locomotive with large bags of valuables. They force the engineer to start the train and move off into the distance to the left.